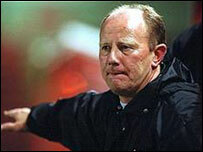 Grimsby Town's third Wembley appearance under Alan Buckley is the one that will give him the most satisfaction. Town take on MK Dons in the final of the Johnstone's Paint Trophy on Sunday and Buckley has not lost at Wembley. He told BBC Radio Humberside: "The work that's been involved this time has been a lot more difficult. "I don't think anyone would have given us a chance of being where we are today. If you look back 14 months ago, they'd have taken that." Buckley will lead his side out at Wembley a decade after piloting Grimsby to a double success at the home of English football. Wayne Burnett's golden goal winner in 1998 against Bournemouth saw Town lift the Auto Windscreens Shield in dramatic fashion and a few weeks later Buckley's team were promoted to the old Division One after a play-off final victory over Northampton Town. 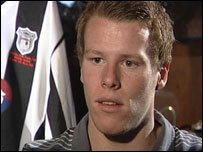 Kevin Donovan grabbed the only goal of the game to send the Mariners up after just one season in the division. The Town manager revealed he was not surprised by his side's achievements in 1998. "The season we went to Wembley twice, John McDermott, Mark Lever and Peter Handyside were there. "Clive Mendonca and John Oster had gone, so I could bring in Paul Groves, Kevin Donovan, Lee Nogan and Burnett in and that team gelled very quickly and they were terrific." However, this season he reckons he has had to do it the hard way. "It is pretty much the same group of players that I inherited so I think the work that has been involved this time has made it more difficult," he explained. The town of Grimsby will be almost deserted for the weekend with the club taking close to 30,000 fans down the M1 to Wembley. Ten years ago, it was the same story with the sign on the way out of Grimsby famously reading "The last one out - please turn off the lights". One of those hopeful fans will get the chance to star at Wembley this time. The club's top scorer Danny North is a local lad and a Grimsby Town fan and was just 10 years old the last time the club went to Wembley. "I can remember the Auto Windscreens final and the winning goal but not much from the rest of the game," said North. "In the build-up to the game and the service stations [on the way down] all the fans were together and it was a great atmosphere." North recalls the feeling of euphoria after watching his team win. "It was an even better atmosphere after winning so really we need to recreate that again and it will give the town a big lift." Buckley will decide just before kick-off whether North starts the game or has to make do with a place on the bench. "Everyone wants to play at Wembley," said the 20-year-old. "Everyone wants to play for their hometown club."